There’s something so very special about setting up your nursery. From picking out the theme to choosing the right mobile, having every last detail just right brings you one step closer to holding your baby in your arms. An essential item every nursery needs is a comfortable place to rock and feed your baby. Unfortunately, finding a plus size glider rocking chair for you and your partner can be frustrating when you don’t know where to look… or what to look for! Many gliders look deceiving with lots of cushioning but have a seat width that’s not much wider than an airplane seat at 17” – 19” wide. When you’re plus size, that’s just not enough! Finding a comfortable plus size rocking chair is essential! 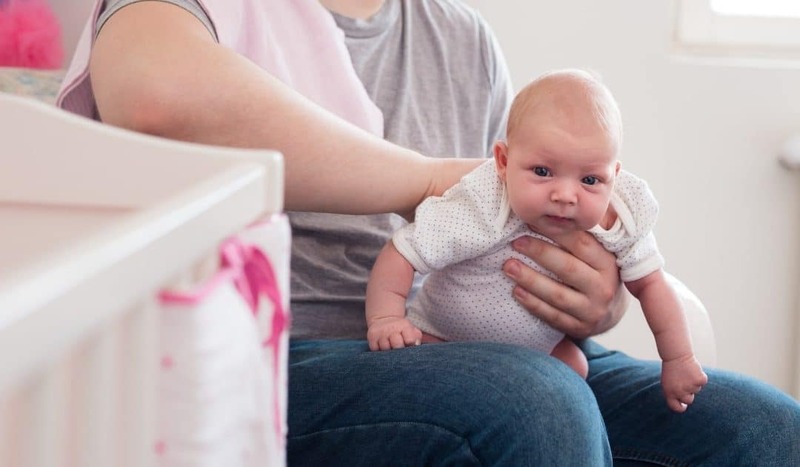 Every new parent can share stories of how often they’ve stayed as still as can be once they’ve finally gotten a fussy newborn to sleep. Then there are the hours spent breastfeeding (or bottle feeding!) with an arm crooked and back arched awkwardly in your seat. We’ve asked other plus size moms and scoured the Internet to bring you the helpful options below! Let’s start by thinking outside of the box. One go-to for many plus size parents looking for an extra large glider is purchasing a La-Z-Boy. If you don’t want to pay the increased price for the brand name you can just buy an extra wide rocker-recliner. 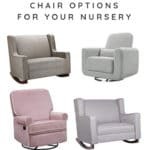 While these plus size recliners don’t have the look of a traditional baby rocker, they are often far more comfortable and durable. Plus, this chair will remain a staple in your home long after your nursery is transformed into a big kid’s room. Below are two extra-large glider rocker designs that are far more affordable than a La-Z-Boy. Grab a cute throw pillow and blanket that matches your nursery colors and you’ll be good-to-go! This glider has a weight limit 250 lbs and material that’s easy to wipe off for spit-up or diaper blowouts (the joys of motherhood). This oversized recliner has some mixed reviews but it’s a great price. One of the reviews said a 300 lb family member sits in it comfortably all the time. 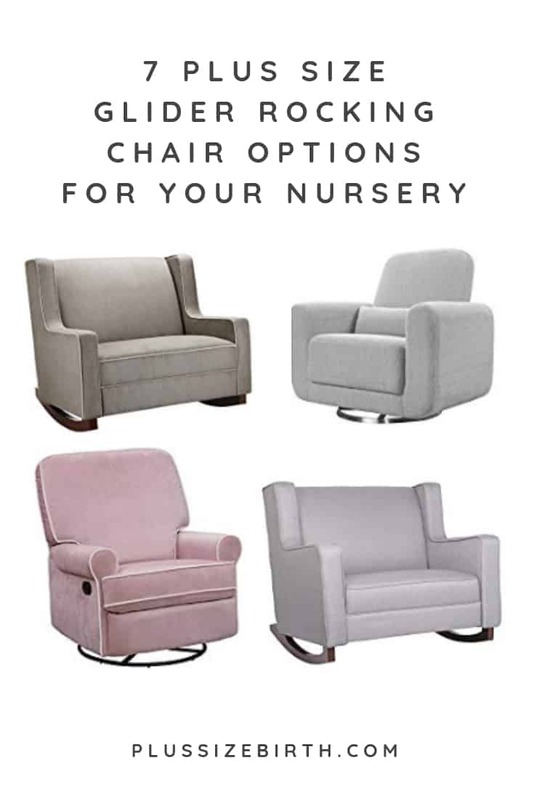 If you want more of that traditional nursery rocker, we’ve got you covered with options below. How adorable is this wide rocker? It has a weight limit of 225 lbs but reviewers say it’s very sturdy and would hold well beyond the recommendation. Esright is another wide rocker option that boasts a more sleek look if your nursery décor is more modern. This pretty pink glider might be a perfect fit for your nursery theme (it also comes in brown and grey). With a 22” seat cushion, it might also be a great fit for you! This uniquely designed glider swivels all the way around with easy to clean fabric. It has a weight limit of 300 lbs with lots of positive reviews online. Since we started this resource with an out of the box idea, let’s end with another one! A patio rocker? Yes! Outdoor furniture is incredibly durable and easy to clean. This chair comes in blue and red and has a 24”seat width. Once you’re done with it in the nursery, you can move it outside to comfortably watch your kids play in the yard! We hope you’ve found this resource helpful! You can also find great plus size rocker options via Goodwill and garage sales in your community. It might take a few weekends of hunting to find the perfect fit for your nursery but that can be a lot of fun to do with girlfriends or your loved one.